The Beach Call Caterpillar bracelet is made of sustainable and recycled stones, crystals and seed beads is perfect for the globetrotter. This popular bracelet is handmade by Fair Trade artisans in Guatemala. Featuring a magnetic closure and measures 7" long by 1" wide. 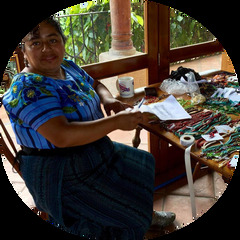 Lucia's Imports LLC partners with Guatemalan families, artisan groups, and cooperatives to maintain a wholesale market for their quality accessories and handicrafts. Lucia's Imports is a member of the Fair Trade Federation and hopes to share the beauty of Guatemala's art and culture while making a difference in the lives of Mayan artisans, one purchase at a time. Working side by side with artisans, we design products rich in tradition and sustainable fashion. Our purses, coin bags, and accessories are made from recycled Mayan textiles and our hand-beaded jewelry is made by artisan groups on Lake Atitlan---utilizing traditional weaving skills in modern design.